Are you tired of having to write down and remember your racial benefits and special abilities each time you have to create a new PC? Don't you wish you had that information was already on the character sheet for you, saving you time from flipping through rule books? Finally you time has come. D20 Fantasy Character Sheets has bee created with the all of the important racial information already listed on the character sheet for you. 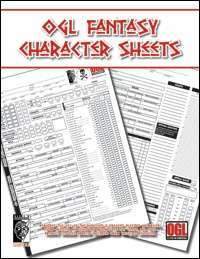 D20 Fantasy Character Sheets covers the major races from the SRD: Dwarves, Elves, Gnomes, Half-Elves, Half-Elves, Half-Orcs, Humans and Halflings. This 16 page PDF supplement is perfect addition sourcebook to fans of D20 Fantasy based games. Created by Louis Porter Jr. Design. This title was added to our catalog on January 31, 2007.